This is a great video from WorkSafeBC on how to prevent forklift injuries from a pedestrian’s point of view. As a pedestrian in a forklift environment, it’s your responsibility to keep yourself safe. Anyone who runs a warehouse or industrial facility understands the dangers, and drivers should be trained. But do you train the pedestrians, the order pickers, the managers, and vendors who sometimes roam your facility? The age-old argument of top-versus bottom-driven horizontal carousels comes up all too frequently (at least among carousel people). You may think it doesn’t matter that much but in fact, it makes all the difference in the world. Supporting something from underneath makes sense. After all, trains, cars and most rolling objects are bottom-supported. Yet, the best designed horizontal carousels in the world are top-supported units that outperform bottom-supported units in both speed and efficiency. How can that be? If you’ve ever stopped at a traffic light, and shuddered at the texting, teenage (or all too often, an adult) driver in the next lane, you probably thought this is an irresponsible person who shouldn’t be behind the wheel. Given statistics that smart phone users are impaired as drunk drivers, it’s a serious and deadly issue; most states have laws specifically forbidding texting on the road. 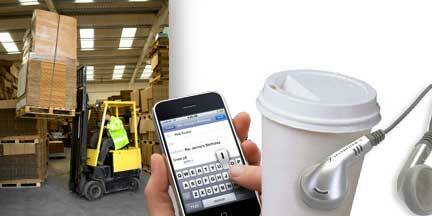 The question is, do you tolerate that kind of distractions for forklift drivers in your warehouse? Should you have the same rules? (Short answer: yes).